With the support of Rhino Turkey, this year Istanbul is added to the destinations of IAAC Global Summer School. Organized by SayaSaya, a private research group on networks and systems both in digital and material systems, Istanbul sessions will take place at Istanbul Technical University, Taşkışla campus. 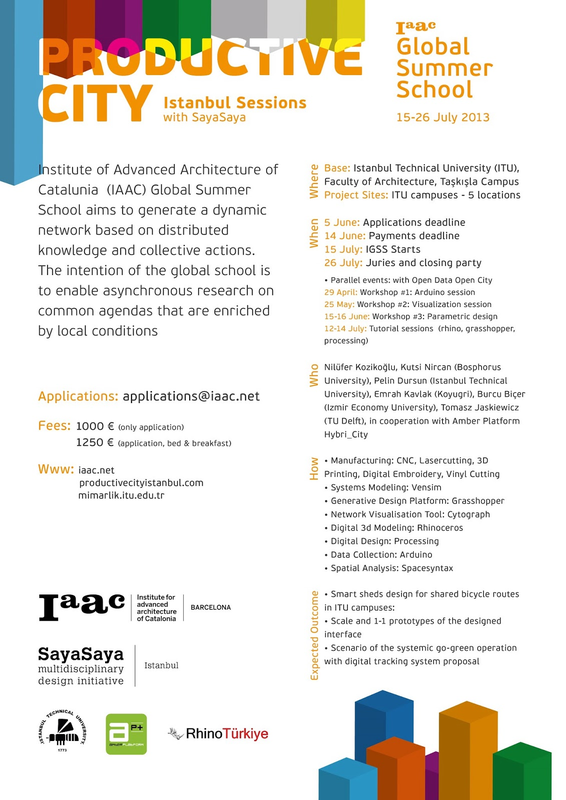 IGSS programme investigates common agendas in global locales and aims to generate a dynamic network based on distributed knowledge and collective actions. This year the theme is 'productive city'. All of the countries IGSS will take place at will be connected 24 hours to share knowledge, develop projects, debate the agenda topic, and explore how the agenda unfolds with the particular economic, biological, and social factors of each locale. The local Istanbul sessions will focus on networks and systems for the environmental and regional scales and urban vegetation integrated structural skin on tectonic scale. The local organizers started the preparations by installing sensor boxes to ITU campus and preliminary workshops on visualization and modeling based on the collected data. Prior to summer school, there will be three days of tutorials for Rhino, Grasshopper, Cytoscape, Processing, Arduino, and Quadrigramm. Contrıbutors: Onur Gungör; Prof Dr Nil Turkeri and IAAC Alumni Gamze Gunduz, Deniz Tumerdem. Sensor boxes and Arduino sessions in collaboraton with Amberplatform’s Hyrbri-city.